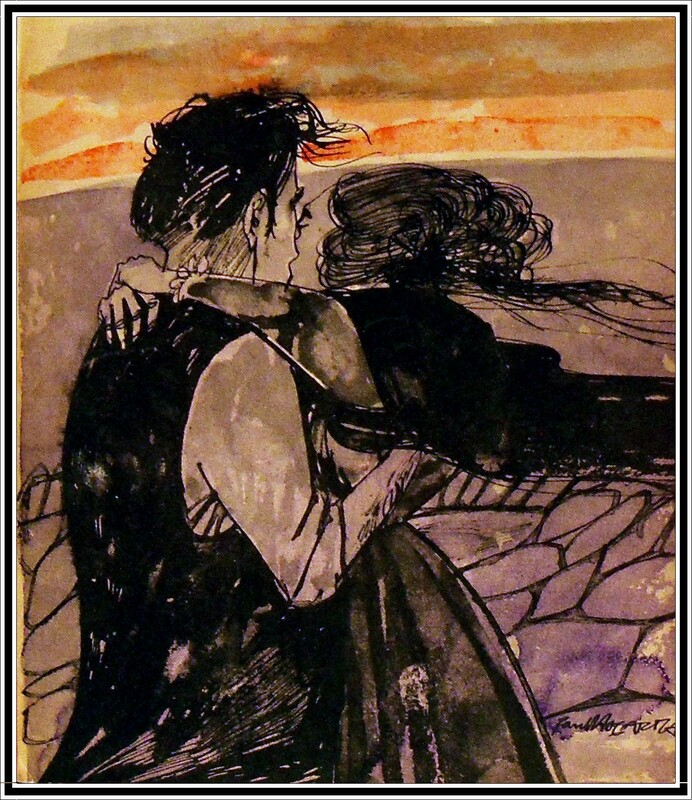 Dominated by the wild, terrible figure of Heathcliff and infused with much of the bleak beauty of its setting, the Yorkshire Moors, Wuthering Heights is one of the most highly imaginative novels in the English language. Such is the intense power of the atmosphere which Emily Bronte builds up that even the incredible Heathcliff seems real and every detail of the fantastic story of his love for Catherine Earnshaw remains clearly remembered long after one has finished the book. It is a strange story, with something of the vividness of a nightmare and something of the beauty of an old ballad, and it contrasts strongly with Agnes Grey and Jane Eyre, the novels which were written at the same time by Anne and Charlotte Bronte. Written by Emily Bronte, first published 1847. Published in Penguin Books 1946. This reprint, 1965. Cover art Paul Hogarth. I’ve said it before and will no doubt say it again – there’s too much running and not enough kissing going on in this blog and so of course I had to share this gorgeously smoochalicious cover of Wuthering Heights the minute I saw it. According to Wikipedia, Paul Hogarth OBE was an English artist and illustrator best known for the cover drawings that he did in the 1980s for Penguin’s Graham Greene’s books. And yes, his artwork is worth looking out for – search for his book covers online and there is an amazing array of his work out there, it’s great. 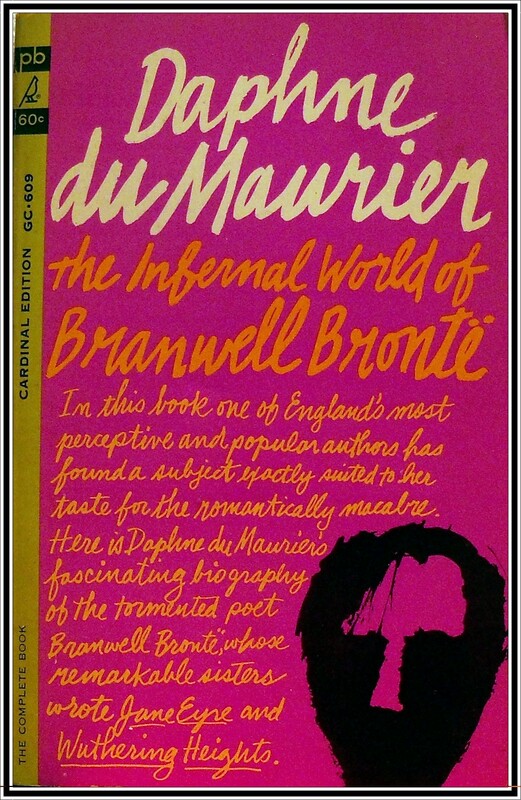 The Infernal World of Branwell Bronte. Written by Daphne du Maurier. Doubleday edtion published March 1961. Giant Cardinal edition published December 1962. 1st printing October 1962. Of all the Brontes, Branwell, as a child, showed the most promise. He was worshipped by his sisters and his widowed father; it was to him they all looked for literary success. Yet he alone was unable to bridge the gap between childhood fantasy and adulthood, and produce a mature, finished book. 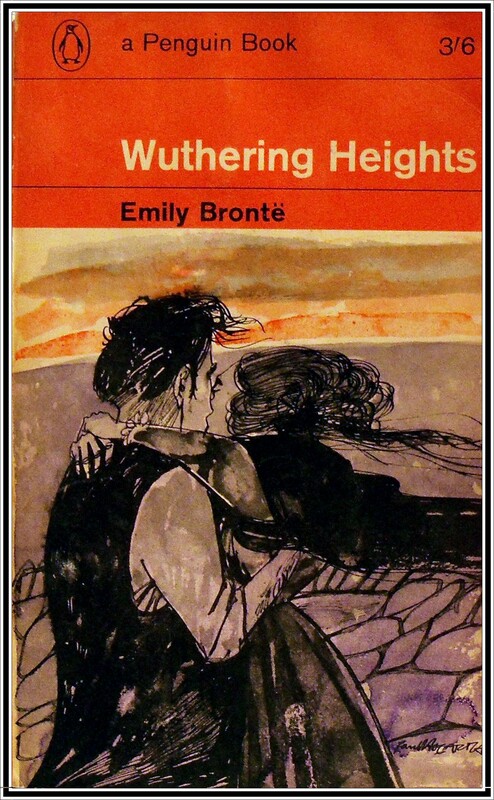 There is, however, no question of his influence upon the writings of his sisters, and certainly Emily drew heavily on him for her memorable portrait of Heathcliff in Wuthering Heights. Conscious to the end of his sisters’ success and his own monumental failure, he turned to a life of dissipation and withdrew to live in the wild, fantastic imagination of his mythical, self-invented kingdom of Angria. It’s an amazing biography – Daphne du Marier’s skill as a novelist and storyteller bringing the life and times of the Bronte family alive. Anyone interested in the writings of the Bronte sisters can’t help but be drawn in by this beautifully written and wonderfully observed portrait of their incredibly talented but deeply troubled brother, Branwell. I bought both these books for £1 at the wonderful Colin Page Books in Brighton, an amazing bookshop known and loved by bibliophiles far and wide. This is the kind of place that sells proper old books – gilt edged, leather bound, dusted in antiquity – rows upon rows of them, stacked floor to ceiling in that wonderful ‘there must be some sort of order to this chaos’ way that real bookstores have. And fear not all you cheap’n’cheerful paperback pulp fans – this place has something for everyone! For outside the shop are a couple of trestle tables where the paperbacks are sold and there is always a great selection, most priced at a very reasonable £1. I’m lucky enough to live and work nearby so this is one of my favourite lunchtime stops for a browse and a bargain! 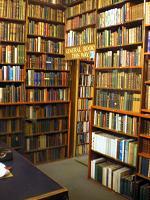 For more info on this wonderful place, check out the antiquarian Booksellers’ Association page HERE.